(Nanowerk News) The discovery of graphene, a material just one atom thick and possessing exceptional strength and other novel properties, started an avalanche of research around its use for everything from electronics to optics to structural materials. But new research suggests that was just the beginning: A whole family of two-dimensional materials may open up even broader possibilities for applications that could change many aspects of modern life. The latest “new” material, molybdenum disulfide (MoS2) — which has actually been used for decades, but not in its 2-D form — was first described just a year ago by researchers in Switzerland. But in that year, researchers at MIT — who struggled for several years to build electronic circuits out of graphene with very limited results (except for radio-frequency applications) — have already succeeded in making a variety of electronic components from MoS2. They say the material could help usher in radically new products, from whole walls that glow to clothing with embedded electronics to glasses with built-in display screens. A report on the production of complex electronic circuits from the new material was published online this month in the journal Nano Letters ("Integrated Circuits Based on Bilayer MoS2 Transistors"); the paper is authored by Han Wang and Lili Yu, graduate students in the Department of Electrical Engineering and Computer Science (EECS); Tomás Palacios, the Emmanuel E. Landsman Associate Professor of EECS; and others at MIT and elsewhere. Diagram shows the flat-sheet structure of the material used by the MIT team, molybdenum disulfide. Molybdenum atoms are shown in teal, and sulfur atoms in yellow. MIT researchers quickly swung into action: Yi-Hsien Lee, a postdoc in associate professor Jing Kong’s group in EECS, found a good way to make large sheets of the material using a chemical vapor deposition process. Lee came up with this method while working with Lain-Jong Li at Academia Sinica in Taiwan and improved it after coming to MIT. Palacios, Wang and Yu then set to producing building blocks of electronic circuits on the sheets made by Lee, as well as on MoS2 flakes produced by a mechanical method, which were used for the work described in the new paper. 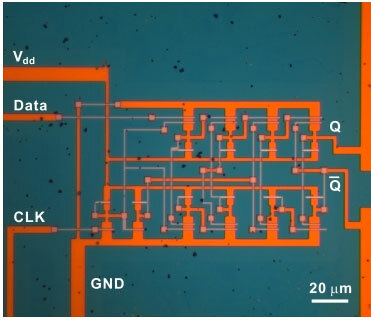 An optical-microscope image shows a complex integrated circuit, called a JK flip-flop circuit, a basic logic device, made on a piece of molybdenum disulfide by the MIT team. Palacios says one potential application of the new material is large-screen displays such as television sets and computer monitors, where a separate transistor controls each pixel of the display. Because the material is just one molecule thick — unlike the highly purified silicon that is used for conventional transistors and must be millions of atoms thick — even a very large display would use only an infinitesimal quantity of the raw materials. This could potentially reduce cost and weight and improve energy efficiency. In the future, it could also enable entirely new kinds of devices. The material could be used, in combination with other 2-D materials, to make light-emitting devices. Instead of producing a point source of light from one bulb, an entire wall could be made to glow, producing softer, less glaring light. Similarly, the antenna and other circuitry of a cellphone might be woven into fabric, providing a much more sensitive antenna that needs less power and could be incorporated into clothing, Palacios says. The material is so thin that it’s completely transparent, and it can be deposited on virtually any other material. For example, MoS2 could be applied to glass, producing displays built into a pair of eyeglasses or the window of a house or office. In addition to Palacios, Kong, Wang, Yu and Lee, the work was carried out by graduate student Allen Hsu and MIT affiliate Yumeng Shi, with U.S. Army Research Laboratory researchers Matthew Chin and Madan Dubey, and Lain-Jong Li of Academia Sinica in Taiwan. The work was funded by the U.S. Office of Naval Research, the Microelectronics Advanced Research Corporation Focus Center for Materials, the National Science Foundation and the Army Research Laboratory.